Braun Eyecare Center was started by Dr. Erwin Braun in 1989. Dr. Braun spent the first part of his career in the U.S. Army. In 1978 he retired from the Army as a Lieutenant Colonel. Dr. Braun then moved his family to Dalton, Georgia, where his wife, Teri, bought the Pearle Franchise for the Dalton area. Over the next ten years, Dr. Braun and Teri built up their practice at Pearle. In 1989, the Brauns ventured out on their own and started their namesake practice, Braun Eyecare Center. Teri managed the optical business and Dr. Braun saw the patients. Dr. Braun, like most successful men, would give much of the credit to his wife and family. Teri is a licensed optician and worked with Dr. Braun over the last twenty years of his career. Dr. Bruce Johnson joined the practice in 1992. Dr. Braun retired briefly in 2003, but returned part-time for the next year. Dr. Braun retired the final time in October of 2004 and settled in Jacksonville, Alabama. Dr. Davis joined the practice in July of 2005 as an associate and progressed to become partners with Dr. Johnson. Braun Eyecare Center is progressively growing as our family of staff becomes larger. In the summer of 2008, Dr. Johnson and Dr. Davis moved Braun Eyecare into our present location on the North Dalton Bypass. 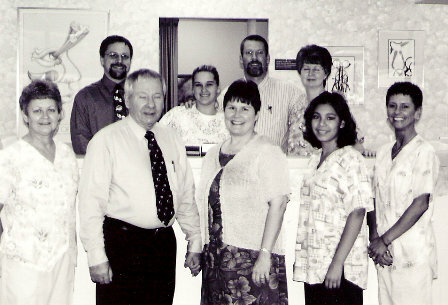 The Braun Eyecare staff at Dr. Braun's retirement in 2004. Ribbon cutting ceremony June 2008.